« How Well Does Your School Teach THE WHOLE CHILD? Grand finale from Betty Botter— a video rhyme performed by students at PS/IS 18 in NYC, NY. 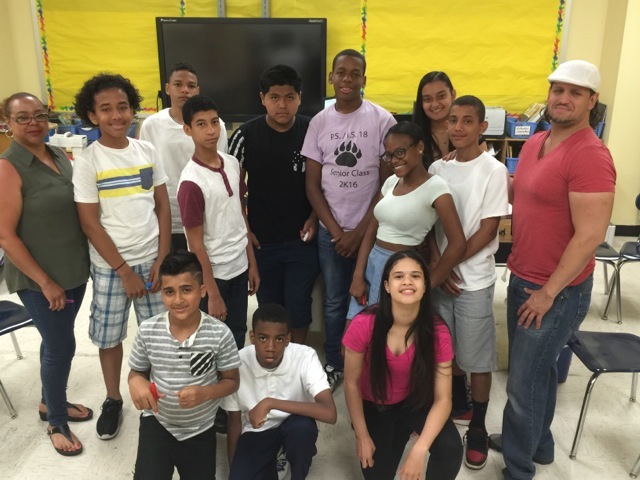 The school is participating in a pilot program to energize ELA instruction with Dramatic Arts. Our Educate the Whole Child initiative promotes a new way to think about education. Over the past thirty years, the kind of thinking demanded by test-driven “education reformers” has dangerously narrowed down the content of K- 12 instruction. Our initiative advocates humanizing the curriculum and diversifying teaching methods. The instructional mismanagement and financial scandals surrounding Newark-style, corporate “education reform” are now a regular feature in the media’s coverage about our schools. The Opt-Out movement has been steadily rising to oppose three decades and billions of dollars wasted on a failed administrative model for teaching and learning. Imagine that this Dark Age known as “School Reform” is drawing to a close. How do we make sure— right now— that the new age in American education will flower into a Renaissance? The most powerful asset that our nation possesses goes to school every day. American kids and their teachers are not only diverse by income, race, class, ethnicity, gender and all the demographic categories— but they are diverse in their aptitudes, talents, gifts, potentials, enthusiasms, their learning styles and what they have to contribute. When schools start using the paradigm of Educate the Whole Child, then our intellectual and scientific communities will have practical reasons to take local educators up to the frontiers of brain-mind research. Teachers in this new age will be instructing multi-intelligent lessons, getting students to use both sides of their brains. 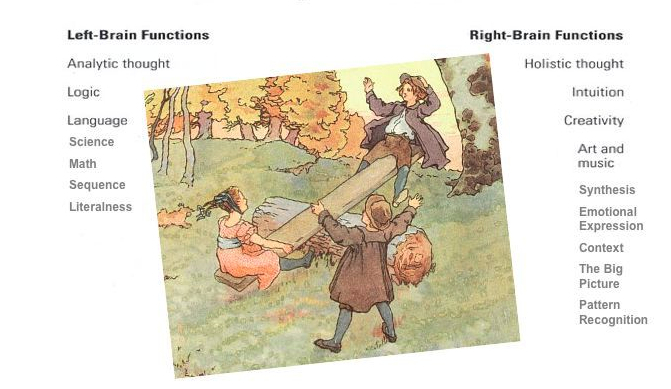 Research may dispute the “left” and “right” locations, but not the descriptions of the related functions. A Whole Child Education can be described as using both sides of the brain. 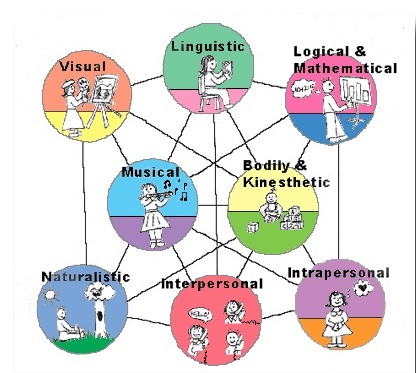 Howard Gardner’s research identifies MULTIPLE INTELLIGENCES. Why do we invest so much time and money to develop just 2 of them? A Whole Child Education can be described as multi-intelligent. Planning Instruction for Multiple Intelligences and for Both Sides of the Brain. Read Aloud Stories to Act Out provides a story text that has been especially authored for teachers to read out loud dramatically; a play version of the story for students to act out entirely or in particular scenes; acting exercises for voice, movement and character development alternating with training in mindfulness, literary analysis and the higher order thinking skills for comprehending a multifaceted work of literature. In New York City, multi-intelligent lesson planning can be guided by professional development and instructional materials integrating the ELA standards and the NYC Blueprint for Theater. 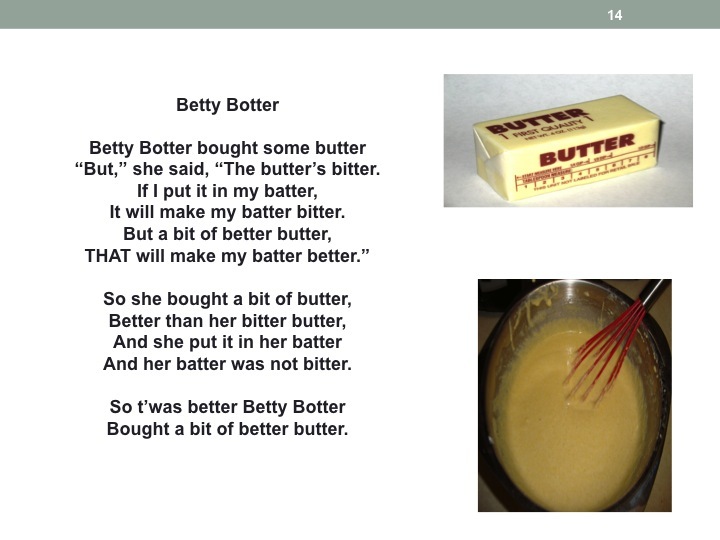 The tongue twisting narrative rhyme, Betty Botter, has become the creative cornerstone for this multi-intelligent, arts-integrated ELA unit. Performing the rhyme while learning voice projection, articulation, and choral speaking skills embeds the text into the imaginations of the students, and into the instructional culture of the classroom. The nonsensical content and syntactical structures become the basis for structuring answers to tongue twisting questions, developing topic sentences and extending student thoughts into coherent paragraphs. For more details about this prototype for a Whole Teacher/Whole Child approach to writing instruction, see our pilot program: Helping Students Scaffold Their Thoughts into Writing. A second video will soon be posted to document Ms. Welsh’s class at PS/IS 18 participating in Rumpelstiltskin, the first of the series Read-Aloud Stories to Act Out. 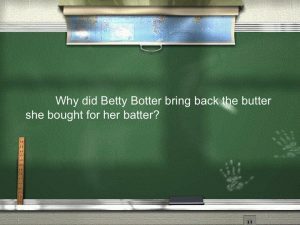 A third video will document, “The Making of Betty Botter.” It will show students engaged in the acting and writing activities that preceded their video performance. Look for more information and videos about these Educate the Whole Child initiatives coming soon. This entry was posted on Wednesday, August 12th, 2009 at 6:50 am	and is filed under Education. You can follow any responses to this entry through the RSS 2.0 feed. Both comments and pings are currently closed.